This article is about a microgame in WarioWare: Smooth Moves. For other uses, see Boom Box. Info "Your opponent looks fierce! Look for your chance and strike! Don’t stop punching until he’s out!" Boom Box is Orbulon's Boss Microgame in WarioWare: Smooth Moves. Its name is a pun on "boombox". The player must keep the controllers up at all times. 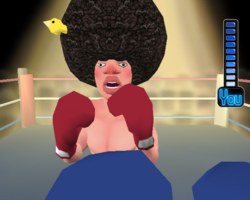 When the opponent's arm drops, the player must quickly keep punching him until he raises his arms again. This process is repeated until the opponent is KO'd. 1st level difficulty: The opponent is not strong. 2nd level difficulty: The opponent is stronger. 3rd level difficulty: The opponent is very strong. The man in this microgame appears in Mona's microgame Wet Your Whistle as the player. In the second level of Wet Your Whistle, the liquid makes him look like the first opponent in Boom Box. This page was last edited on January 1, 2019, at 14:05.